Apparently Britain is the most CCTV-heavy nation on the planet, but easy-to-use services to check up on your house when you're not there have yet to really kick off. New wireless video monitoring service ConnectVu aims to change all that. 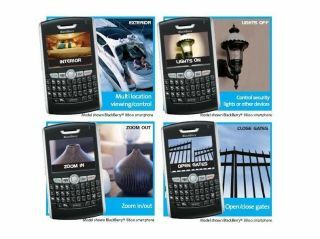 It offers CCTV or video feeds straight to your mobile phone over GSM/GPRS/3G and other mobile networks. Video is streamed at up to 10 frames per second - so good enough to get a decent view of your house or other location. An application is installed on your mobile phone which communicates directly with the ConnectVu server. Once up and running, you'll be able to drive so-called PTZ (pan-tilt-zoom) cameras or control connected systems or devices in real time from your handset. You can check on multiple locations, switch lights on and off, zoom in and out, and close gates. The server gateway makes the connection between the camera and the mobile handset without the need of firewall, network or router configuration. You can view video streams on multiple devices, including mobile handsets, internet-connected computers and Wi-Fi-enabled devices. The included software enables you to record and playback video streams. Most video-equipped handsets from Nokia, Sony Ericsson, Samsung, Motorola, LG et al are supported, as are BlackBerry and Pocket PC devices.